Lightwood Lane Colliery SK 47/57 404786. (SK. 440455 378618). 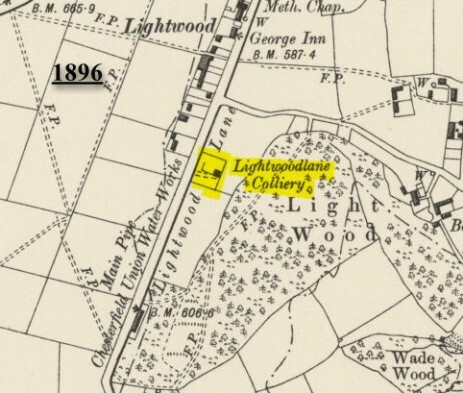 This is a small colliery and there is no information available at this time for inclusion other than it was included on the 1896 maps onwards and there are some of the pit buildings still in evidence on the ground. Colliery not shown on maps earlier than 1890 but there are some old coal pits in the area which would suggest that exploited a previously worked area. I include it because of the remains photographed in 2003. May possibly have been to supply air and materials or to remove the coal for another nearby local colliery.